Irish studio NOJI Architects experimented with plywood to create the three different kinds of structure that frame this extension to a terraced house in Dublin. Named Scale of Ply, the project employs a trio of different structural frameworks, all built using plywood: a system of glue-laminated (glulam) beams, a prefabricated diagrid and a skewed lattice. NOJI Architects developed the complicated form after being asked to extend and rationalise the rear of a two-storey Victorian-built residence with adjoining properties on both sides. "This house was dark and damp, with a poorly constructed conservatory as the main source of light and link to the garden," explained NOJI Architects, which is led by architect John Monahan. The old conservatory was removed and existing interior spaces opened out, creating a large open-plan kitchen and dining space with a sheltered terrace and a generous window seat overlooking the garden. "The layout maximises the south-west orientation, and allows both internal window seat and external covered areas to relate to the garden," said the studio. 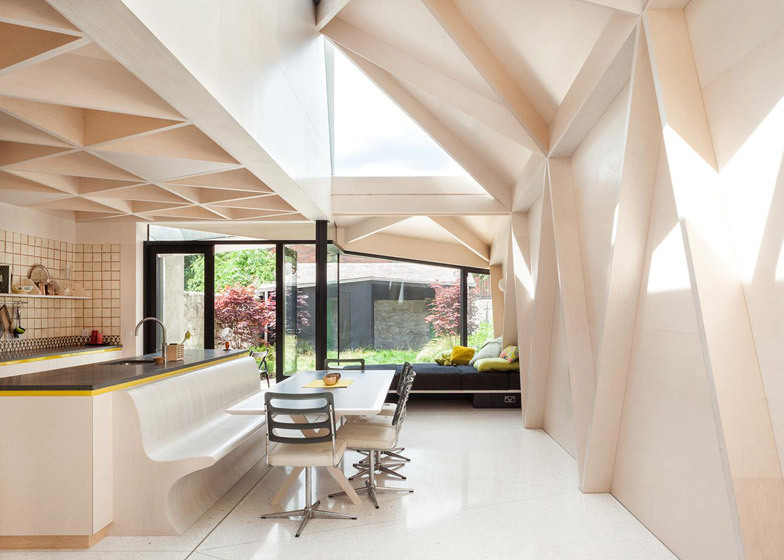 The three different plywood structures each perform a different task – the glulam beams support the first floor above, the diagrid creates a ceiling above the kitchen, and the lattice forms the walls and roof of the extension. The only steel component needed was a column that supports the two glulam beams at the point where they meet. Sheets of plywood were also used to line the interior of the space, but were slotted behind the framework rather than in front, leaving the triangular modules exposed. In some places, the panels act as a bracing. "The project uses plywood as a primary and secondary structural material, and as an internal skin," added the studio. Glazing was added between some of the beams that make up the lattice, forming skylights above the dining table. Seating is provided here by a custom-built bench. The garden-facing end wall is fully glazed. One side steps outwards, framing the upholstered window seat. Glazed doors with black-painted frames open out to the small outdoor dining deck, while the patio beyond creates an intermediate space between the house and the garden.